When your country and culture has been invaded symbols take on a greater importance. Flags represent defiance and identity. A reminder of what is threatened, of the past, and future hopes. They serve as a center too, enabling also the expression of cultural and national unity. For Tibetans all of the above and more apply to their national emblem, possession of, or displaying it in occupied Tibet gets you arrested, tortured and dispatched to a forced-labor camp. 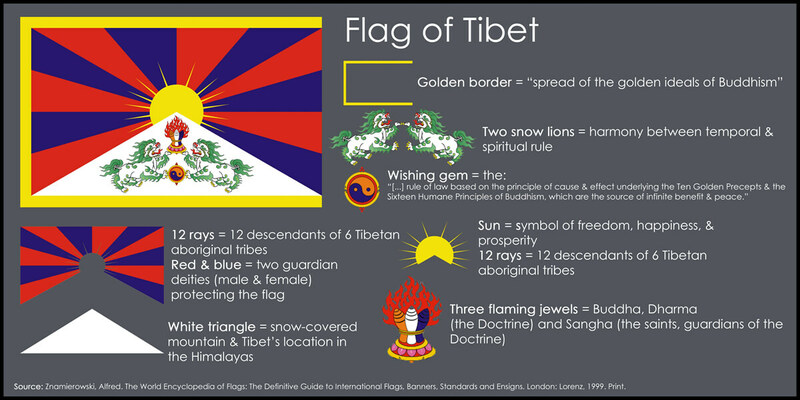 This March 10 across many cities in the USA, Europe, Asia and Australasia Tibet’s flag will be raised at rallies and marches. It’s design is beautiful and contains a rich symbolism, which is explained in the image above.